EASTERN forces and troops loyal to the Tripoli government fought on the outskirts of Libya’s capital yesterday as thousands of residents fled from the battle. The Libyan National Army (LNA) forces of eastern commander Khalifa Haftar held positions in the suburbs 11km south of the centre, with steel containers and trucks with mounted machine-guns blocking their way into the city. Residents reported LNA planes buzzing Tripoli and the sound of clashes in outskirts. Mr Haftar’s forces were engaging Prime Minister Fayez al-Serraj’s fighters at the former international airport, one soldier said. The United Nations said at least 4,500 Tripoli residents had been displaced, most moving to safer districts of the city. Many more were trapped, it said. The LNA forces moved out of their stronghold in east Libya to take the sparsely populated but oil-rich south earlier this year, before heading a week ago towards Tripoli, where the internationally recognised government sits. Libya has been split into rival eastern and western administrations since the 2011 topping of former strongman Muammar Gaddafi. He ruled for more than four decades before falling in a Western-backed revolt. Since then, political and armed factions have vied for power and control of Libya’s oil wealth, and the country split into eastern and western administrations linked to shifting military alliances after a battle for Tripoli in 2014. The UN wants to bring both sides together to plan an election and way out of the chaos. Its humanitarian agency said it was extremely concerned about the “disproportionate and indiscriminate use” of explosive weapons in densely populated areas. Half a million children were at risk, it added. As well as the humanitarian consequences, renewed conflict in Libya threatens to disrupt oil supplies, boost migration across the Mediterranean to Europe, scupper the UN peace plan, and encourage militants to exploit the chaos. Isil killed three people in a desert town under LNA control two days ago. In Tripoli, nearly 50 people have died, mainly fighters but also some civilians, including two doctors, according to latest UN casualty estimates. The toll is expected to rise. Several thousand migrants, detained after trying to use Libya as a staging-point for crossing the Mediterranean to Europe, have also been caught up in the crisis. The UN, European Union, United States and G7 bloc have appealed for a ceasefire, a return to the UN peace plan, and a halt to Mr Haftar’s push. 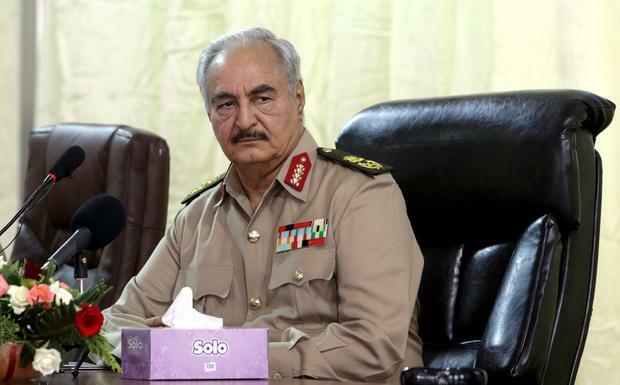 Opponents cast him as a would-be dictator in the mould of Gaddafi, though Mr Haftar projects himself as a champion against extremism.